The Dingo Brick Forks are recommended to carry only 1 pack of standard bricks. ie a 1/4 of the pallet. Either model Dingo can safely CARRY this load. By carry we do not mean lift. To carry, the load should never be raised more than 100mm above the ground. The heavy duty K9-4 can safely carry 2 packs. The front tyres would need higher inflation for this. DO NOT LIFT THESE LOADS. 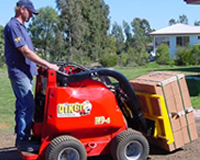 Used By: Brick layers, Landscapers, Builders and Paving Contractors.